Note: Make sure the engine is cool. If the condition of the engine looks exceptionally clean or parts of the engine look very clean, beware. The seller may have detailed the engine to make it look better than it really is. Remember, it's your right to inspect the automobile. If the seller refuses to allow you to inspect any of the areas on this checklist, you have the right to walk away from the automobile. In this section, try to locate the source of any leaks you may have found in Section A. Check the underside of all belts. Look for cracking, glazing (a shiny/smooth look caused by a slipping belt), fraying and general wear. Generally, there should be no more than ½ inch play when applying moderate pressure to the belt with your thumb. The amount of play varies with each automobile, so use this as a rule of thumb (no pun intended, really!). If you can, check the owner's manual. Check the ends of the hoses for leaks, cracks and fraying around the clamps. Also look for kinks, bulges of swelling, loose connections and overall deterioration. The hoses should feel firm but pliable. Feel each hose for weak, soft or spongy spots, especially around swollen or bulging areas. If the hose has hardened, it will have to be changed. Warning! Do not smoke around the battery, the hydrogen gas it gives off is explosive. Do not let the battery electrolyte (which contains sulfuric acid) contact your skin or eyes. If you should happen to come in contact with this fluid, flush the area with plenty of water and get medical help immediately. Check the condition of the cables and look for corroded or loose terminals. Make sure the battery is secure in the housing and the case has no cracks. If the battery has removable caps, open them, one by one, and check for a low electrolyte level. The liquid should be up near the bottoms of the filler holes in each one. If the battery has an indicator eye, it should be dark with a green dot. If the eye is light, the battery should be replaced. If there is no green dot, the battery will have to be recharged. Warning! To avoid the danger of being scalded, do not attempt to remove the radiator cap when the engine is hot. Take the radiator cap off and check the condition of the rubber seals, there should be no signs of deterioration. Run your finger around the underside of the radiator opening, there should be no residue. Most automobiles will have expansion tanks where coolant is added to the system. Check the level and color of the coolant in this reservoir. It shouldn't be below the minimum line. If there is rust color in the coolant, the radiator will have to be flushed or replaced. The coolant level in radiators with or without expansion tanks should be up to the radiator filler neck. Don't forget to check the color of the coolant. There are wires weaving throughout the entire engine area. Newer automobiles have replaced the mechanical ignition system with a computer controlled solid state system. In the older automobiles, the wires to be especially concerned with are the ignition wires. The easiest place to start is with the distributor. You can locate the distributor by locating the large black wires that connect it (the distributor) to the spark plugs. These, and all other wires from the distributor should be checked for cracks, burned spots and wear. Check carefully the wiring from other components connected to the distributor. The oil dipstick is one of the thin rods with the loop at the end. The other similar, but shorter dipstick will be for the transmission in automobiles with automatic transmissions (see: Section E). Pull the dipstick out, wipe it with a rag and put it back in all the way. Pull it back out and check the dipstick for the level and color of the oil. The normal color for motor oil is faint brown. If the oil is black, it needs to be changed and the filter needs to be replaced. Low oil could mean the engine leaks or burns oil. Rub some oil between your fingers. It should feel smooth, not gritty. Thin or dirty oil with the smell of gasoline indicates internal engine problems. The following two items are for automobiles with carburetors, Fuel injected automobiles are exempt. The air filter is located in the large round or oval object on top of the engine called the air cleaner housing. There should be a wing nut or two and/or clips that hold the lid. Sometimes the wing nut(s) are replaced with regular nuts. Take the lid off and lift the filter out, being careful not to knock any dirt into the carburetor. Light should pass through the filter when held up to sunlight or strong light. If not, gently tap the filter on the ground. If dirt falls out, the filter should be replaced. While you have the lid to the air cleaner housing off, push open the flat piece of metal in the throat of the carburetor called the butterfly and inspect down into the throat. It should be clean, not black with soot. When replacing the lid to the air cleaner housing, look for the arrow on the lid and line it up with the arrow on the housing. Don't forget to refasten the clips and/or nut(s). You will sometimes find two reservoirs for the brake fluid. Sometimes you will see the two reservoirs as translucent plastic cylinders, one larger than the other, covered by round lids you can remove by hand. These reservoirs will have the fill lines on them. Other times you will find the two reservoirs in a rectangular container with a lid held by a retaining clip. This clip will have to be pried off with a screwdriver. Other reservoirs of this type will not have the retaining clip. In this case, simply pry off the lid with your fingers. In either case, the fluid level should be near the top of the reservoirs. Still, other times you will find only one translucent reservoir, either square or round, covered by lids you can remove by hand. As with most engine components, most of these will be covered with dirt and grime making it difficult to locate. 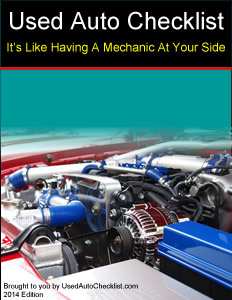 Check a repair manual before you look at an car, truck, van or SUV (Part I, Step 3). The few minutes you spend will help you feel more secure about the inspection and your confidence will show the seller you mean business. If you're still not sure, don't be afraid to check the owners manual. Once you find these reservoirs, you should wipe the dirt and grime off the lids before opening them. This will help avoid getting any contaminants in the fluid. The fluid also absorbs moisture from the air so avoid prolonged exposure to air. Don't spill any brake fluid, It will eat paint. Check the level according to the markings on the reservoirs or the instructions in the owner's manual. This check excludes the cable-operated clutch. The clutch fluid reservoir is a translucent single cylinder and is most likely near the brake fluid reservoir. All the same guidelines for checking the brake fluid apply to the clutch fluid. They both use the same type fluid. This is for additional devices or anything that looks odd, like loose parts, melted plastic, disconnected wires, etc..Write down your observations.